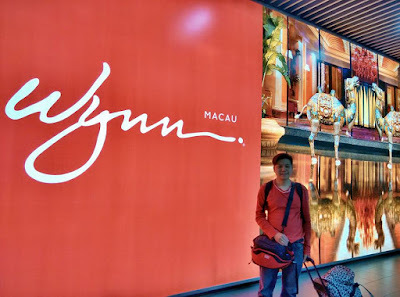 We finally landed on Macau (I noticed some hotels and tourist sites spell it as Macao) after 4 hours on air. Refer to the previous post on our experience flying with Air Asia and first time in KLIA2. If you are keen to know, you can check out my winning entry Dream Trip to Macau. 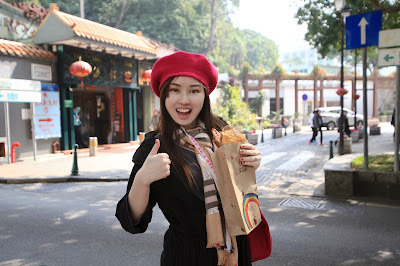 I did not specifically follow my itinerary coz I was too tired and lazy on the last day therefore I focused on shopping. However you will find my Macau trip posts useful as I stated the timings, what bus to take and many other important details for you to plan easily. Be warned this post is gonna be a long one. 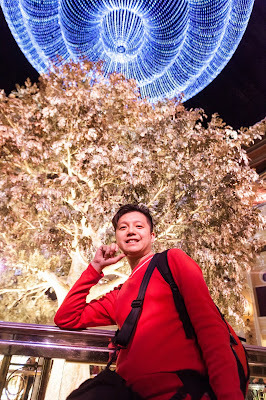 Big thanks to Nuffnang and Macau Government Tourist Office (MGTO) for the dream trip. 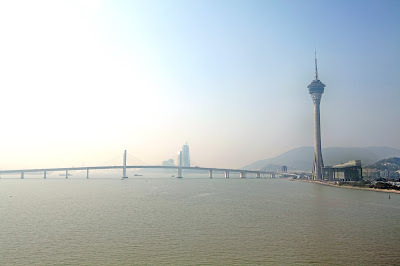 We arrived Macau at 10:15am. It was ridiculous to sit on the shuttle for just a 10 second ride to the gate when we could easily walk across. At first I thought there's another faraway terminal. I understand that it's for safety and convenience but I wouldn't wanna be crammed up with other passengers while I can walk freely to the gate within 10 steps. They could also save on resources and use the service only during rainy days to transport the passenger. First thing we saw inside was this. We will meet these two camels later in the evening. 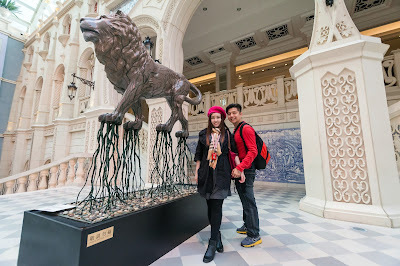 Truly Macau is the Asian Las Vegas but there's also a vast heritage sites which I will show you on the 2nd day here. 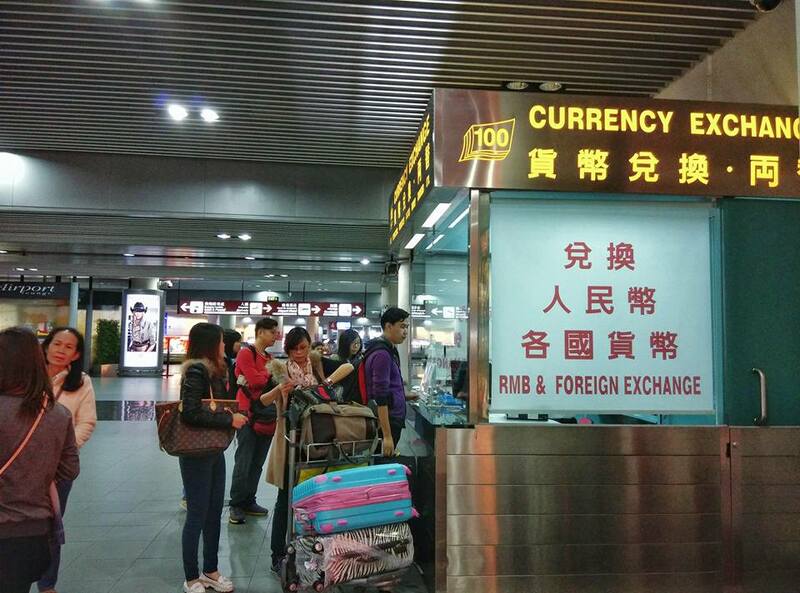 You won't miss the currency exchange as soon as you walk out to the arrival hall. As in February 2015, the exchange rate was MOP1 = RM0.44. Don't forget to drop by the MGTO tourist information center to get your free copies of maps and guides. By the way temperature in February was like in an air-conditioned room about 18-20°C. Time to check into the hotel first. 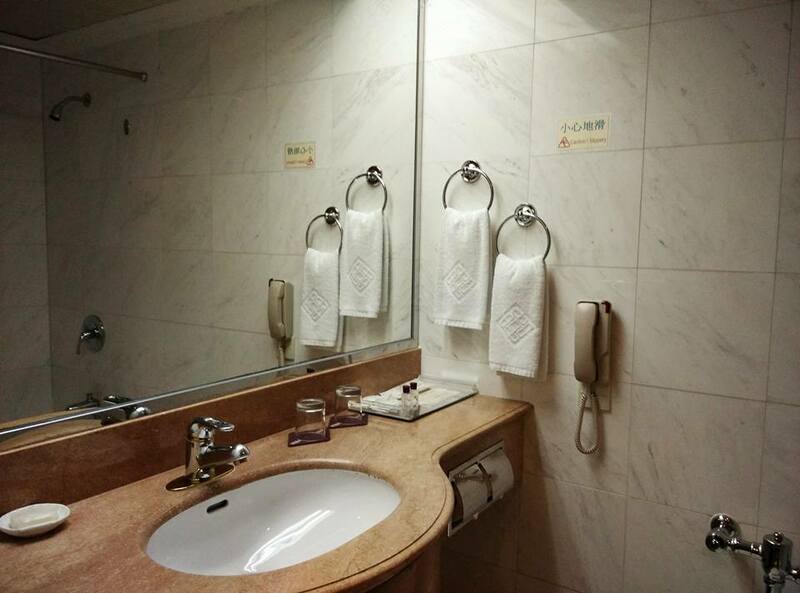 Our night stay at Golden Crown Hotel (金皇冠中国大酒店) costs MOP880. 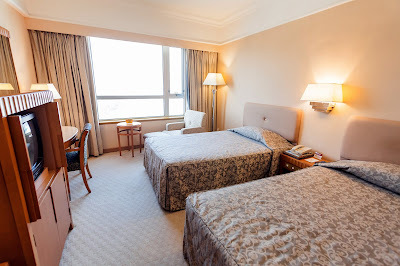 We chose this hotel for our first day due to convenience as it is situated right in front of the airport. 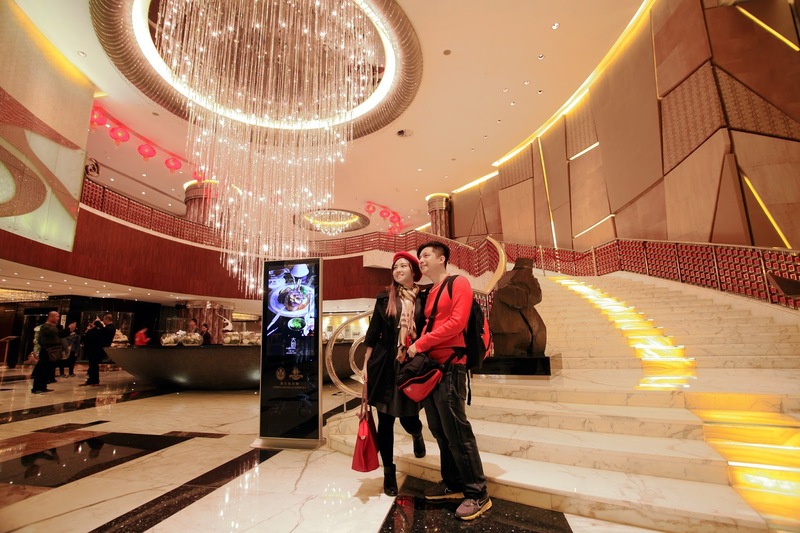 Hotels in Macau are on the expensive range typically RM400 and above. I was kinda shocked when I did my research as hotels in HK are much cheaper so I had to raise my budget. We were sponsored 2 nights so this was for the extra night we extended. 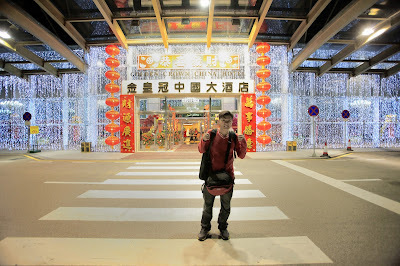 From where I was standing in this picture, it was outside of the airport entrance and all we did was just to walk across to the festive looking hotel entrance. Lobby at 9th floor. Yeah, you have to go up to the 9th floor to check in. 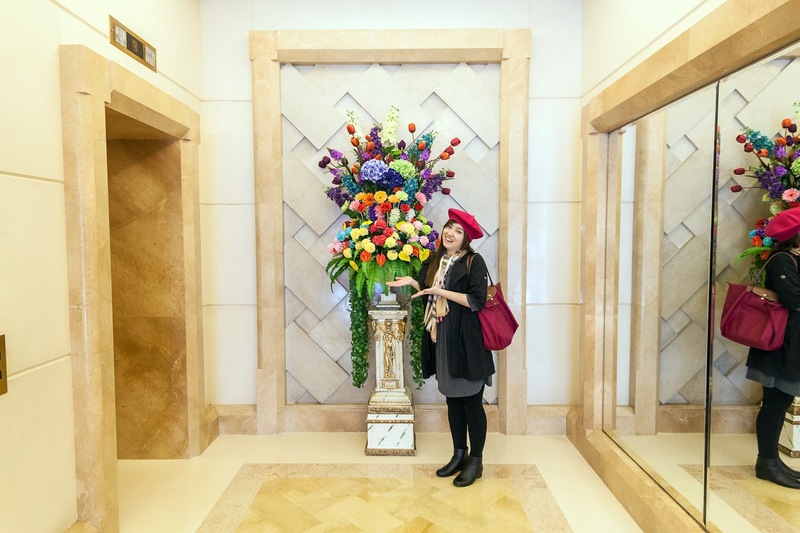 The lift hallway is also beautiful. 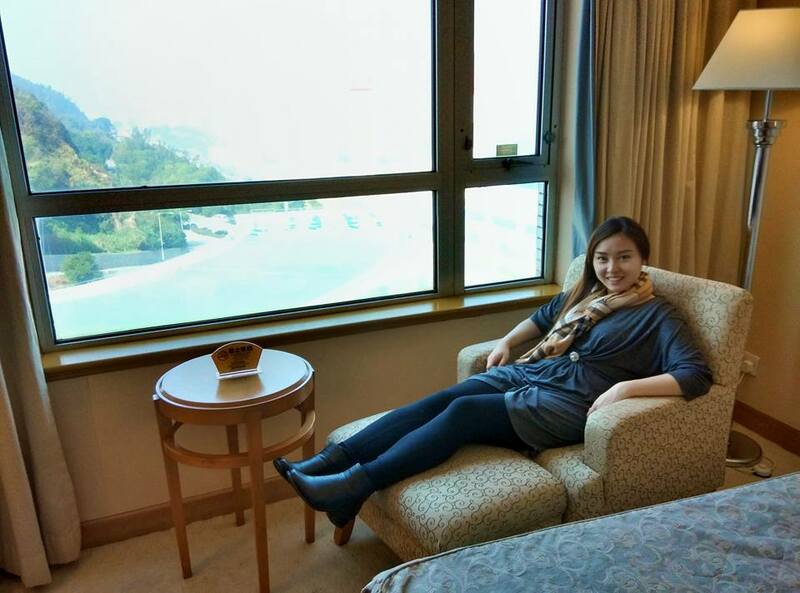 We booked deluxe but were upgraded to business room facing a supposedly beautiful view of the mainland. Too bad it was hazy (or misty?). The room was a little outdated but enough for a good night's sleep. Washroom is acceptable but would prefer to be more well lit and updated. 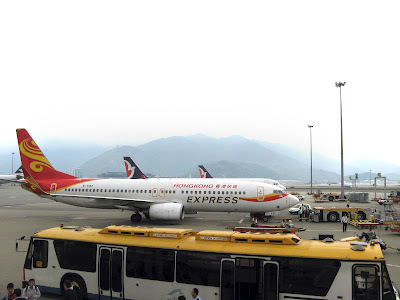 Did I tell you we barely hear sound of planes though its right in front of the airport. The first part of the day is to explore Galaxy Macau and Taipa. Time allocated is 2.5 hours. One tip is to take advantage of the free shuttle provided by various hotels. Hotels that do not have casino might require your booking slip. 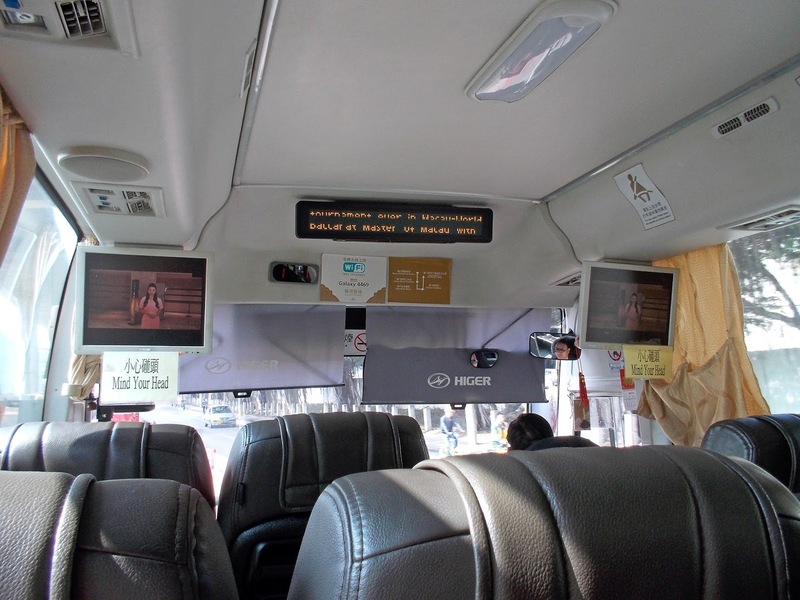 Free shuttle by Galaxy Macau from airport to the hotel starts at 10am - 11pm every 15 minutes. We took the shuttle at 11am. Haha jakun at the padang as big a football field. 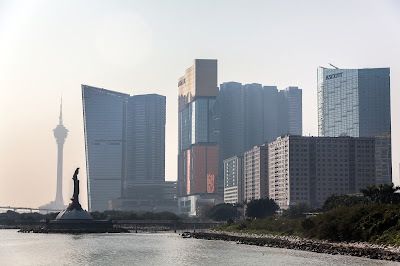 Galaxy Macau (澳門銀河綜合渡假城) is located on the Cotai Strip. I'll explain about Cotai Strip in the next upcoming posts. Construction on the Cotai project began in 2002 but its opening has since then been rescheduled several times. 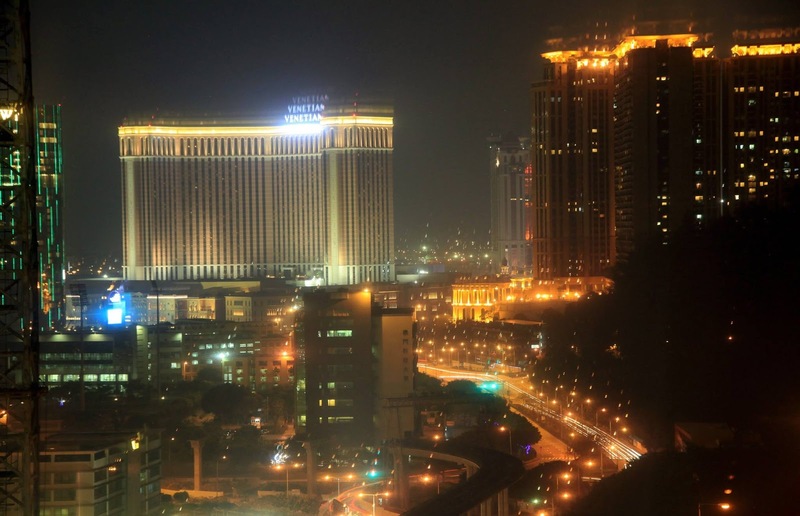 The USD 1.9 billion Galaxy Macau resort officially opened on 15 May 2011. From what we saw, the enormous resort is still currently under renovation while Phase 2 is under construction. True to its name, Galaxy is made out of clusters of prominent hotels like Ritz-Carlton, Banyan Tree, JW Marriott and many more. Room rate typically starts at HKD1288 (Broadway Hotel). So cool leh the hummer limo. Wish for a ride. One part of the lobby. I would say this is a very grand welcoming lobby. Fortune Diamond turns into a giant roulette wheel before a giant diamond rises out of the top. It's a metaphor for wishing casino goers eternal luck and prosperity. Too bad we didn't stay long enough to witness the show. It lasts for 5 minutes and repeated almost every 1 hour. Among the amenities here are six swimming pools, including a wave pool and an artificial 2,000 square meters beach made of 350-tonne white sand which we didn't get to see either. I believe this is a temporary deco for Chinese New Year. It's right in front of the casino and behind the fountain. There are also other attractions that we missed. for example the bus lobby houses a series of giant crystals that float above a pool of water. The crystals have adopted advanced motion sensor technology that triggers special visual effects when guests walk near the crystals. When all the crystals are activated, good luck symbols flash from the crystals and reflect in the water. After spending 20-30 minutes at Galaxy, we walked towards Taipa for 5 minutes. We passed by aquatic center and a school. 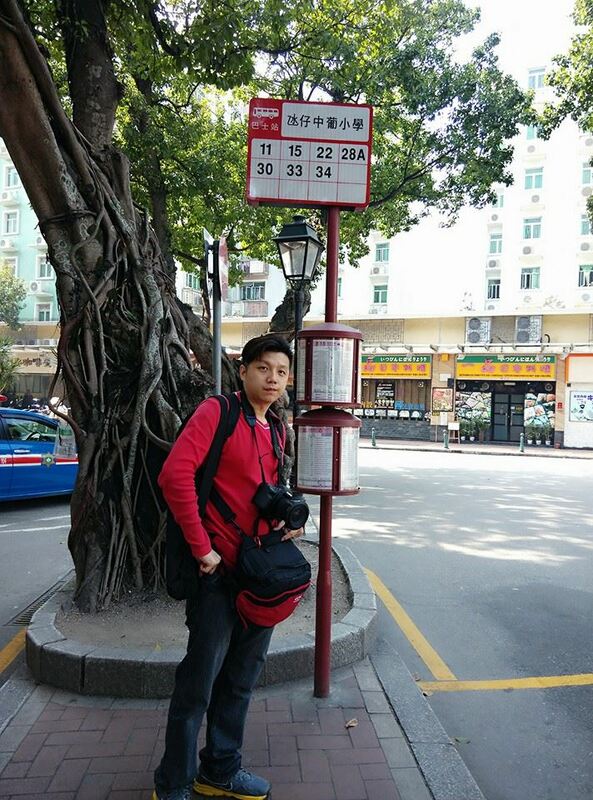 You know you are at Old Taipa Village when you see this square. 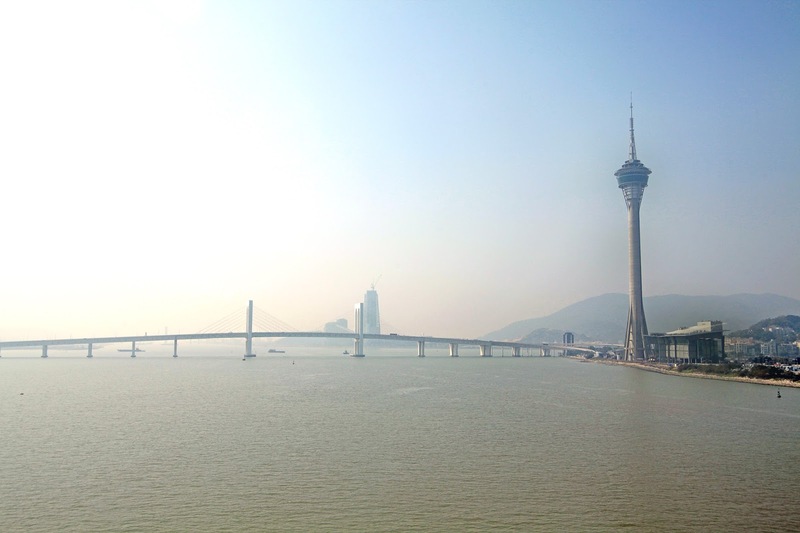 Taipa used to be an island on its own before the reclaimed Cotai Stip connects it to Coloane. We will come again to visit Rua do Cunha, a narrow food street 2 days later. Can you see the stretch of food outlets? Just follow the signs...or smell then you will come to this alley. Walk straight ahead and you won't miss it. 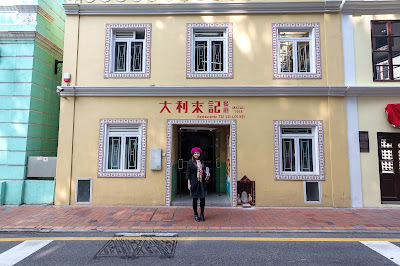 Tai Lei Loi Kei (大利來記) was established since 1968 by Ms. Kwok Loi-ho. The original stall has been abandoned when we got here and they have moved a few steps away into a more hygienic premise. 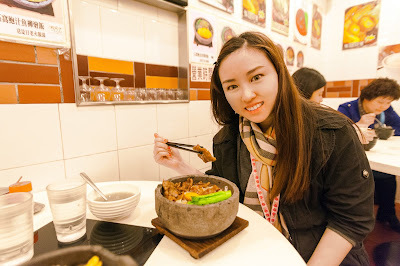 A pork chop bun is one of the most popular snack in Macau and has been described as a Macanese specialty. 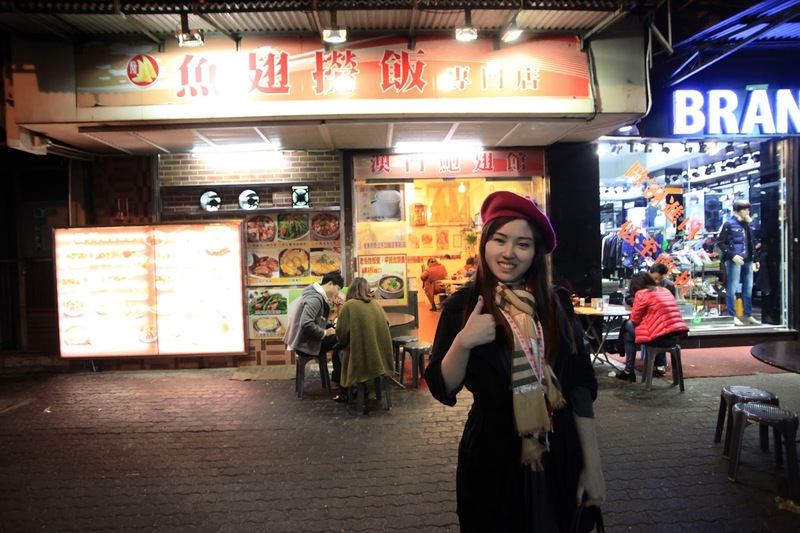 The piggy bun is extremely crisp outside and very soft inside and also tasted sweet. 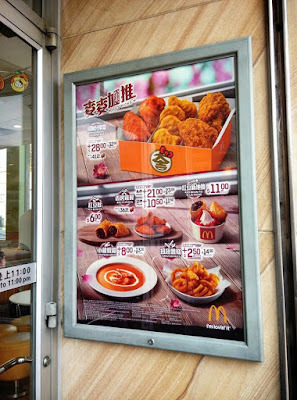 A fried pork chop is filled into the bun. 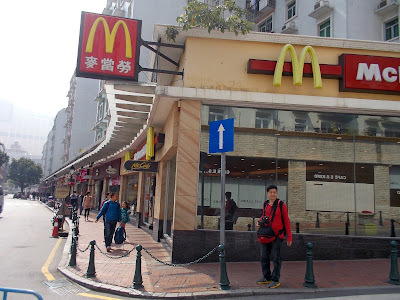 It has been described as the Macanese version of a hamburger. 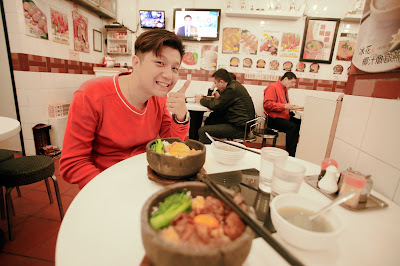 After coming back from Macau only I found out there are a couple of Tai Lei Loi Kei branch in KL. 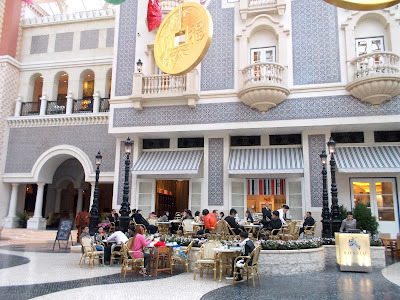 We should have bought in Venetian on the last day to save time just like we skipped going to the original Lord Stow's and bought the tarts in Venetian. Nevertheless it was a wonderful first time experience at Taipa.We will come again couple of days later. Gosh the super reflective mirrored windows made us think its just a piece of wall or hollow building with trees behind. 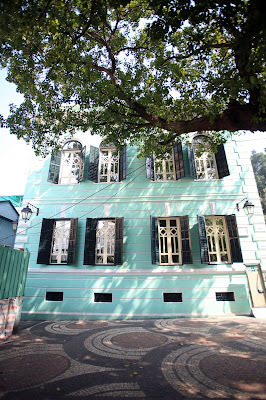 But actually this is Museum of Taipa and Coloane History (民政總署). 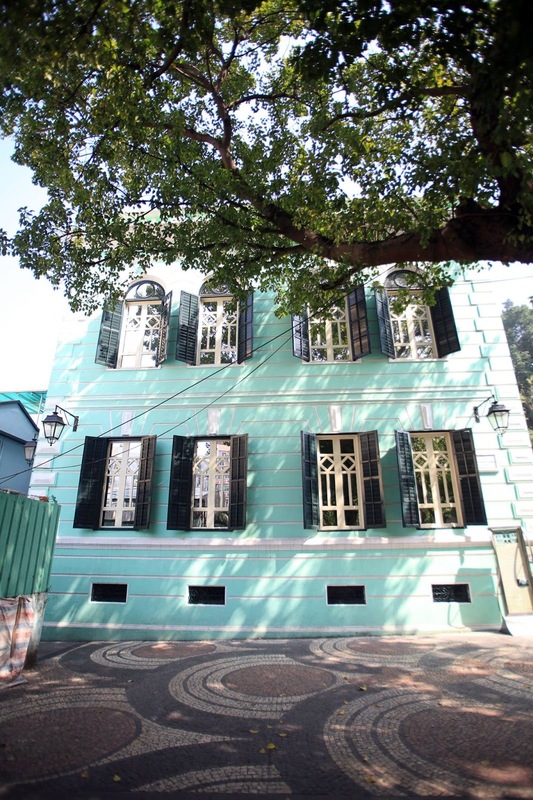 The Portuguese-style building that was constructed way back in the 1920s now housing the Museum of Taipa and Coloane History was formerly a public administration building. The exhibits inside the Museum of Taipa and Coloane History are in two floors which consist of nine exhibition rooms, a video presentation area and of course, a souvenir shop. Opens daily 10am - 6pm except Mondays. Entrance fee is MOP5. We walked back to where we came. Ahhh...never seen before menu in my country. 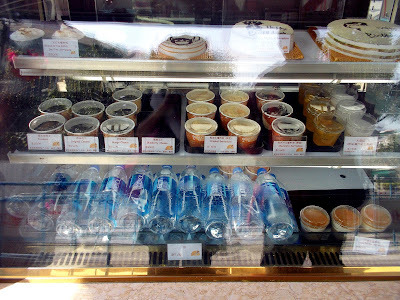 Gonna try crayfish soup and red bean pie with strawberry sundae in a few days. 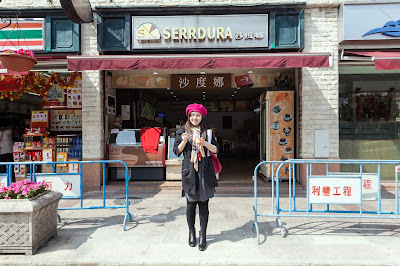 We came up to a shop called Serrdura selling serradura which is Portuguese for sawdust. 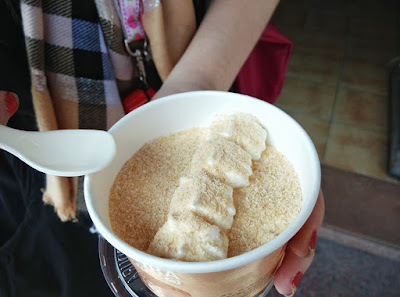 There are many other shops selling this dessert but we simply settled for this one. Another must try food off the list. And you can choose from these varieties. We bought the original one at MOP18. Serradura is basically a sawdust pudding. Why is a dessert called that way? It doesn't need a stretch of imagination to see that it refers to the way the biscuits crumbs and pudding look. The authentic way to make is apparently using Marie tea biscuits on top of vanilla flavoured whipped cream with milk. Peninsula. You could also stop by Grand Prix Museum which is just nearby the square but we decided not to due to lack of time. We surely tried to squeeze as much as possible into our 3 full days on ground. 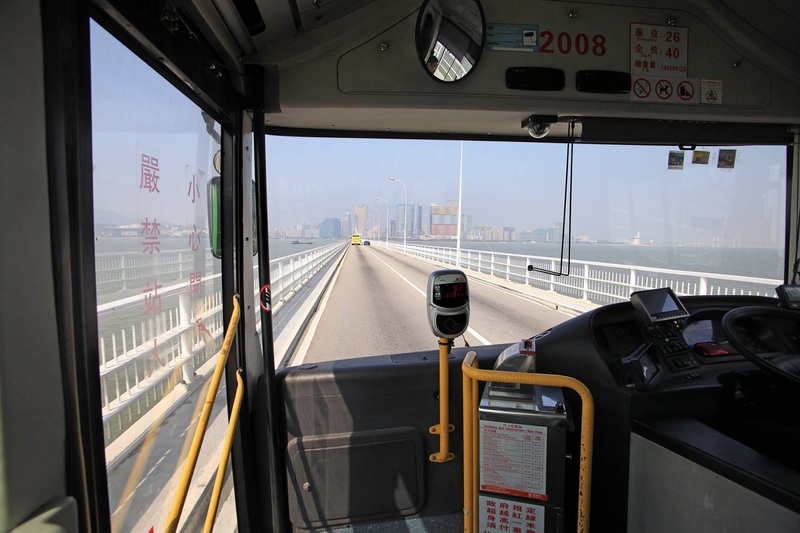 You can take bus number 28A towards Ferry Terminal and get down at Auto-Sila. The ride is around 45 minutes. 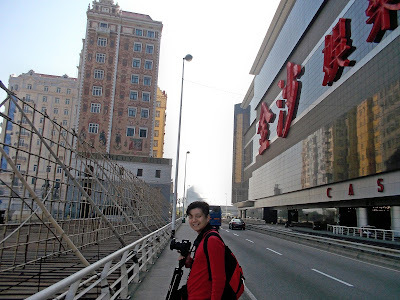 Spot the Grand Lisboa lotus architecture. Awesome view while crossing to mainland. So here is our plan. 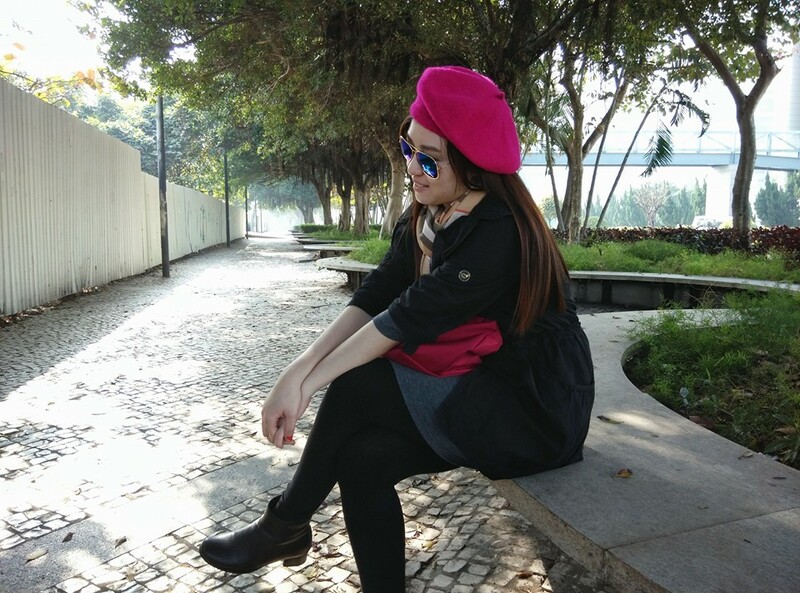 You may add Grand Prix Museum if you have time coz its very near Lotus Square. 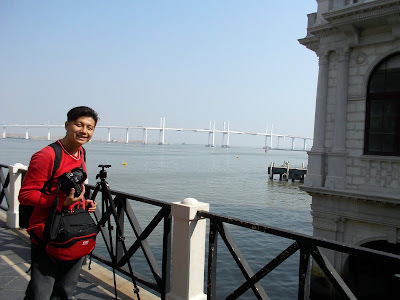 We started with Lotus Square then walk towards Fisherman's Wharf then to Macao Science Center but we did not go in due to lack of time. 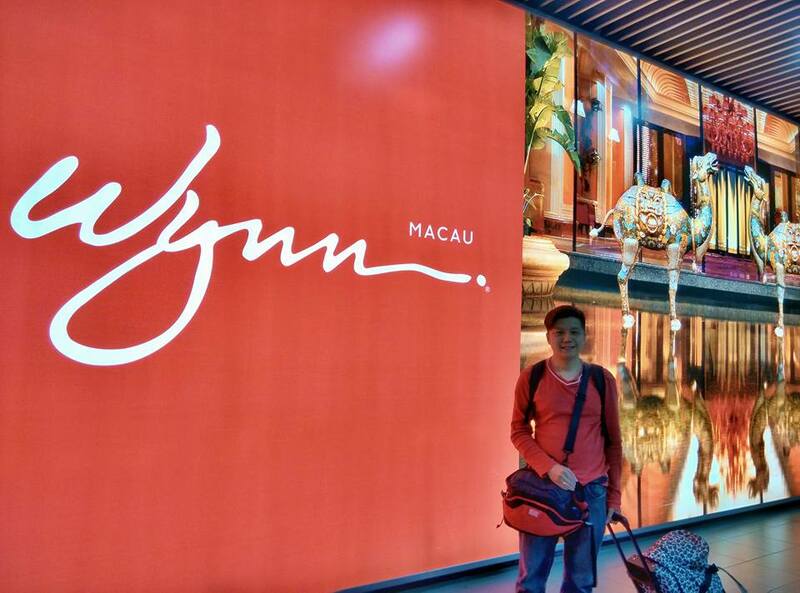 Next we walked to Kum Iam Ecumenical Center then to MGM, Wynn and lastly Grand Lisboa before a random dinner. 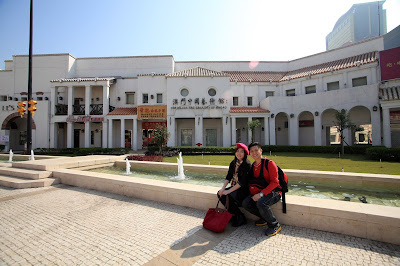 First stop was Lotus Square ( 金蓮花廣場)which is just across Grand Prix Museum. 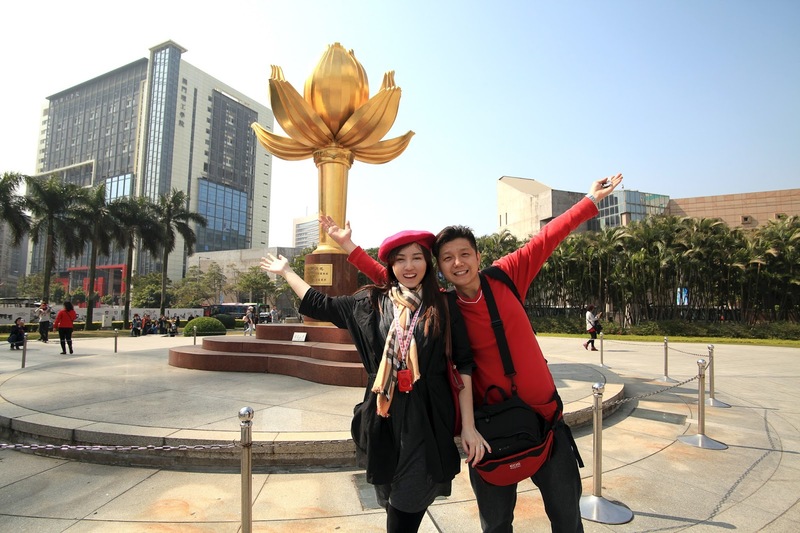 The square features the large bronze sculpture Lotus Flower In Full Bloom standing 6 meters high. 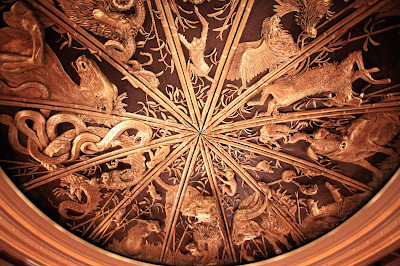 The base consists of 23 pieces of red granite in three layers and in the shape of lotus leaves. 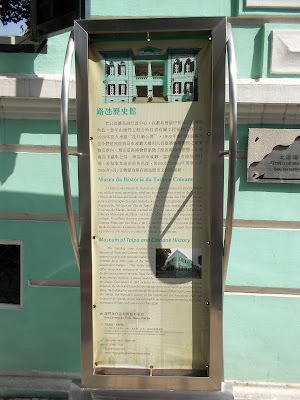 These signify the three main parts of the territory: Macau Peninsula, Taipa Island and Coloane Island. 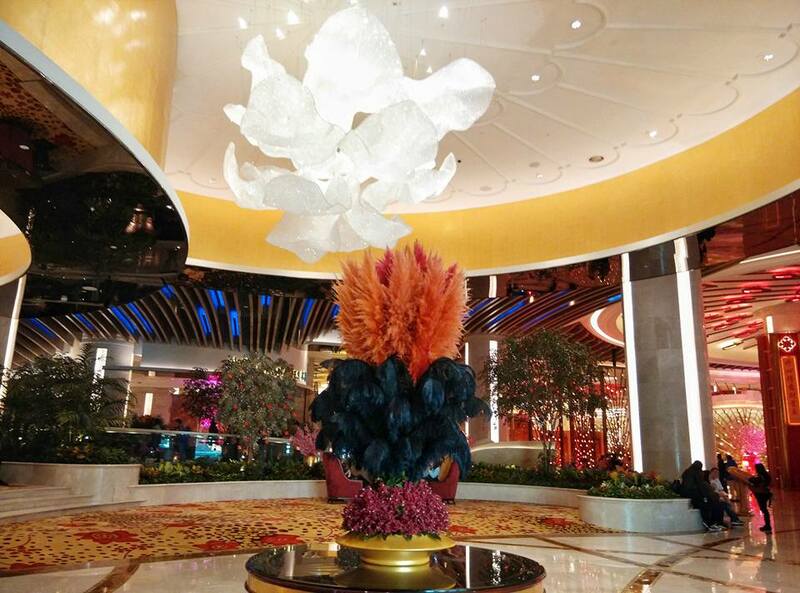 The lotus flower in full bloom symbolizes the everlasting prosperity of Macau. 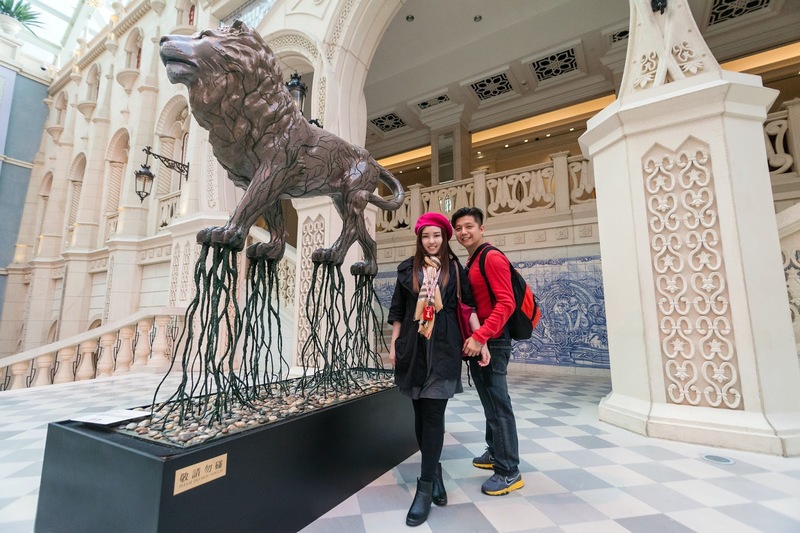 The sculpture was presented by the State Council of the People's Republic of China in 1999 to mark the Macau sovereignty transfer from Portugal to the People's Republic of China. 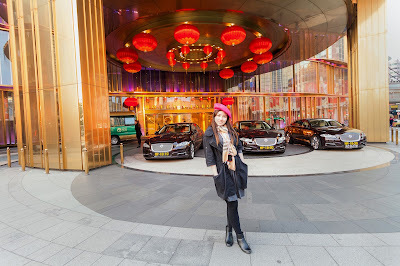 After spending like 10 minutes taking photos with the lotus, we walked across the road through a bypass tunnel to Fisherman's Wharf (漁人碼頭). Though this is the first theme park in Macau, it looks kinda empty and underrated. The whole area opens 24 hours and free of charge. 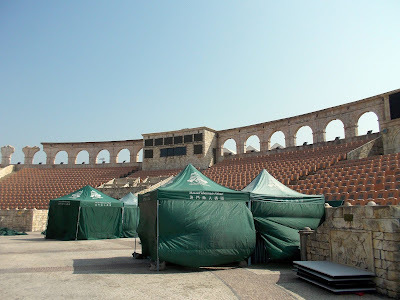 Behind the arena seats you get to see a beautiful Colosseum replica. The construction of the theme park took 5 years before officially opened on 31st December 2006. About 40% of Fisherman's Wharf is reclaimed from the sea. We only spent 25 minutes here taking photos and resting on the bench. Ouch...my feet started aching from wearing those fashion boots. There are quite a few handicraft stores, souvenir shops and restaurants all over the area. The complex includes over 150 stores and restaurants in buildings built in the style of different world seaports such as Cape Town, Amsterdam and Venice, six rides, a slots hall, a 72-room hotel and a casino spanning over 111,500 m2 of area. Great view of Governor Nobre de Carvalho Bridge also known as the Macau-Taipa Bridge and locally known as The Old Bridge. Ok, it's time to move on to the next pit stop. I don't know if it is an Asian thing but we are kinda kiasu when it comes to travel. 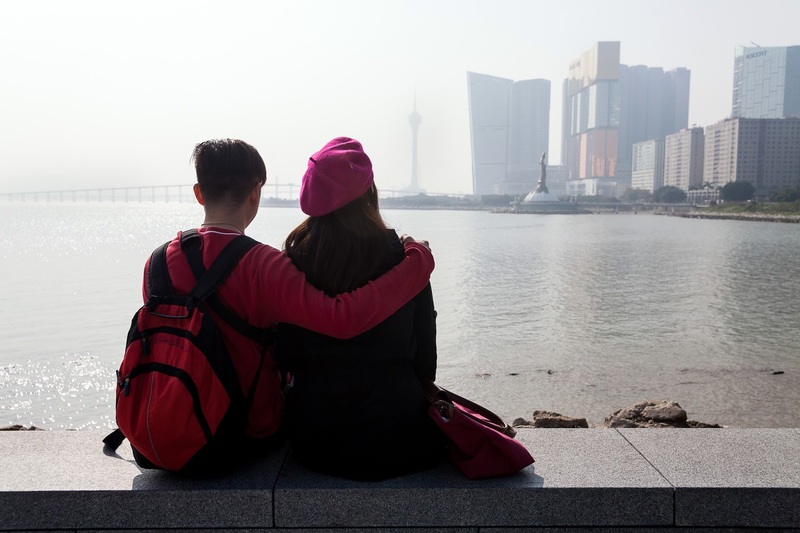 Instead of visiting a place of two and relaxing like there's nothing to lose, we try to squeeze as much places as possible to go when we visit a new country. So typical, right? Walk straight ahead and you will see the science center. 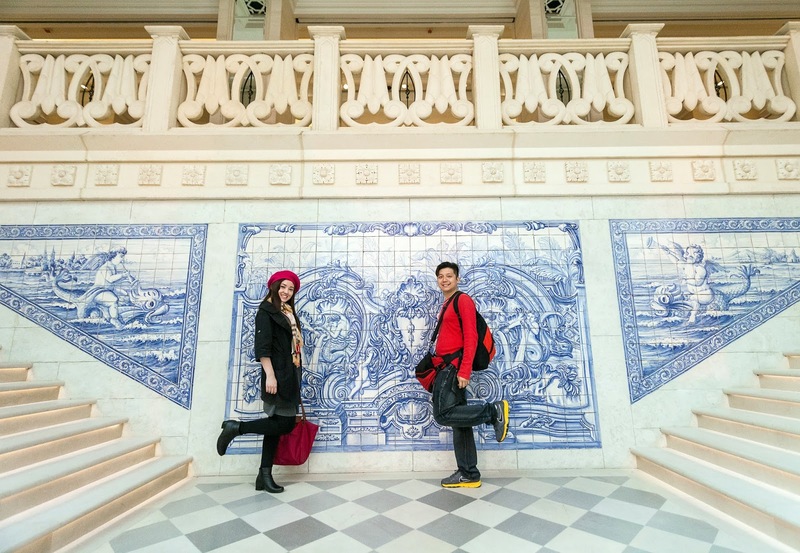 Macau is so backpacker friendly! The artsy building on the left is Harbourview Hotel while on the right is Sands Casino. Ah...here it is the most futuristic building of all. 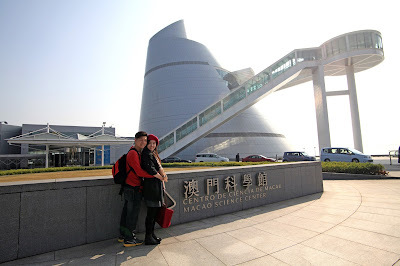 Macao Science Center (科學館) was conceived in 2001 and completed in 2009. 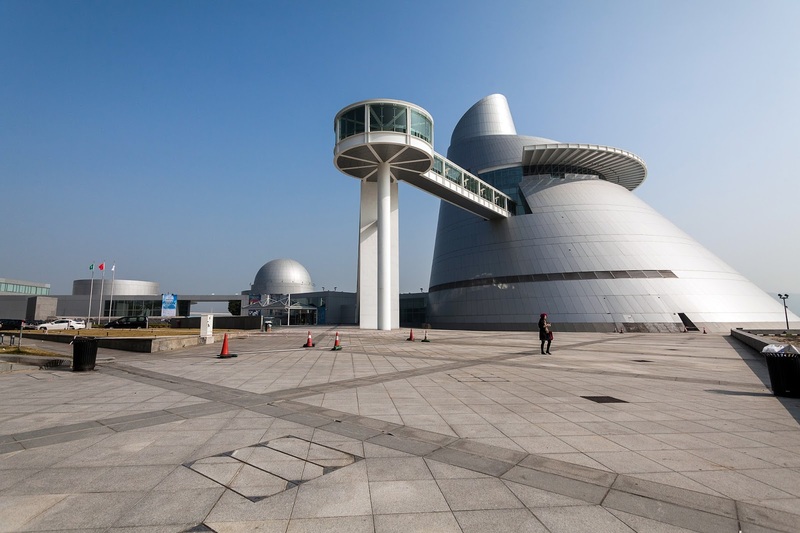 The main building has a distinctive, asymmetrical, conical shape with a spiral walkway and a large atrium inside. Opening hours are Monday to Sunday from 10am to 6pm and closed on Thursdays and Lunar New Year’s Eve. 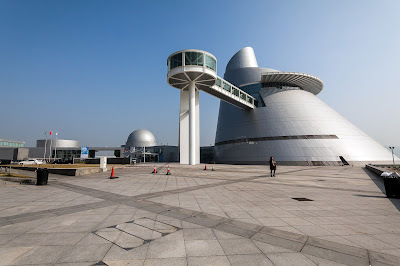 Standard ticket for exhibition center is MOP25 and MOP60 for planetarium. Galleries lead off the walkway mainly consistsof interactive exhibits aimed at science education. 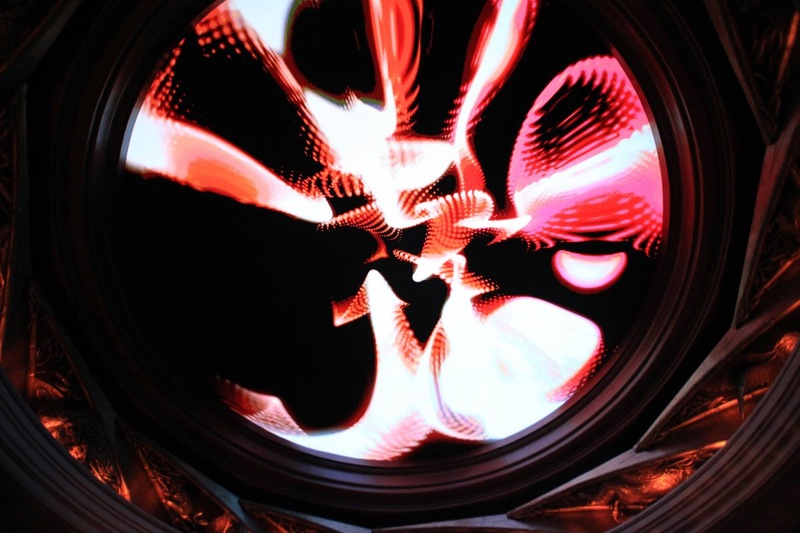 There is also a planetarium with 3D projection facilities and Omnimax films. Due to lack of time and hubby's suggestion that it's not important, we hanged around the outside. Truly a gorgeous view of our next pit stop. I allocated like 2 hours in my itinerary coz being a nerd I planned to enter the exhibition center but we only spend 20 minutes lepaking. Kun Iam Ecumenical Center (觀音) is located on the outer harbour. 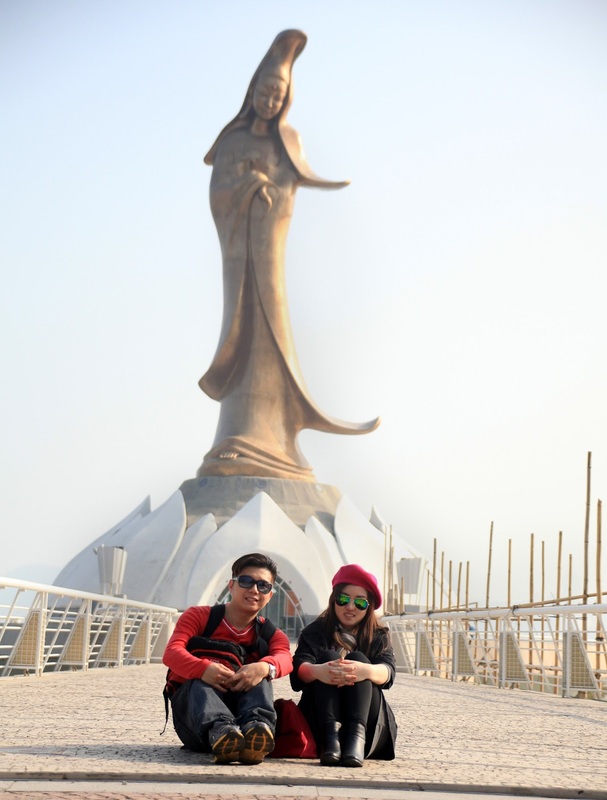 This statue which stands 20 meters tall and made of bronze is dedicated to the Goddess of Kum Iam (Goddess of Mercy). The dome shaped base is like a lotus flower and is an ecumenical center where there is information available on Buddhism, Taoism and Confucianism. Admission is free and opening hours are 10 am till 6pm and closed on Friday. 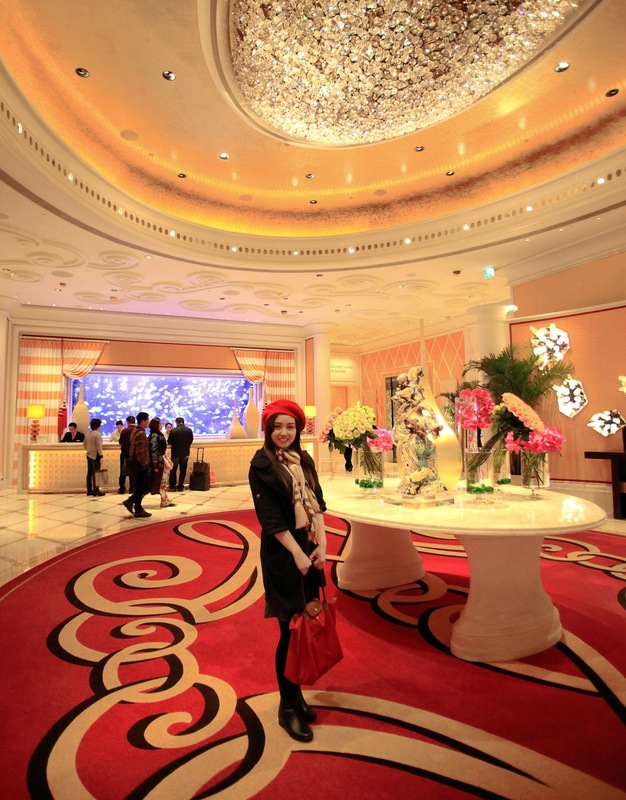 After visiting some educational tour like a field trip, we went hotel hopping...more like casino hopping. Devil is grinning in the pic. Before that, we rest a while in this serene looking path. After a long long walk we reached our first hotel, MGM. MGM Macau is formerly known as MGM Grand Macau. It is a 35 storey 600 room 5 star casino resort opened in 18 December 2007 at a cost of US$1.25 billion and owned by Pansy Ho, daughter of Macau casino magnate Stanley Ho. Wow OMG! So glad my online research paid off. I viewed almost every single famous hotel lobbies in Macau to see which one is worth visiting. This magnificent underwater realm of “Water Aurora” features an intricate interplay of shadow and light in Grande Praça where the water meets the sky. 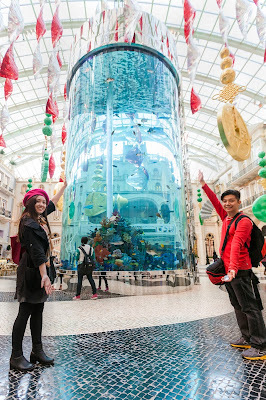 The breathtaking 8-meter tall cylindrical aquarium built at the beginning of 2013 with a coral palace overhead brings visitors face-to-face with more than 1000 fish swerving into the horizon. Got meh 1000? All I saw was tiny fishes magnified by the cylinder glass. Visitors can see the sharks and other fish such as Blue Ring Angelfish and Tomato Clownfish being fed by qualified divers at selected times. The resort also hosted one of Macau’s first mermaid shows at this aquarium. I'm not sure if the mermaid show is still on but they will always offer new shows from time to time. We entered to what I think is a lobby towards casino or hotel. 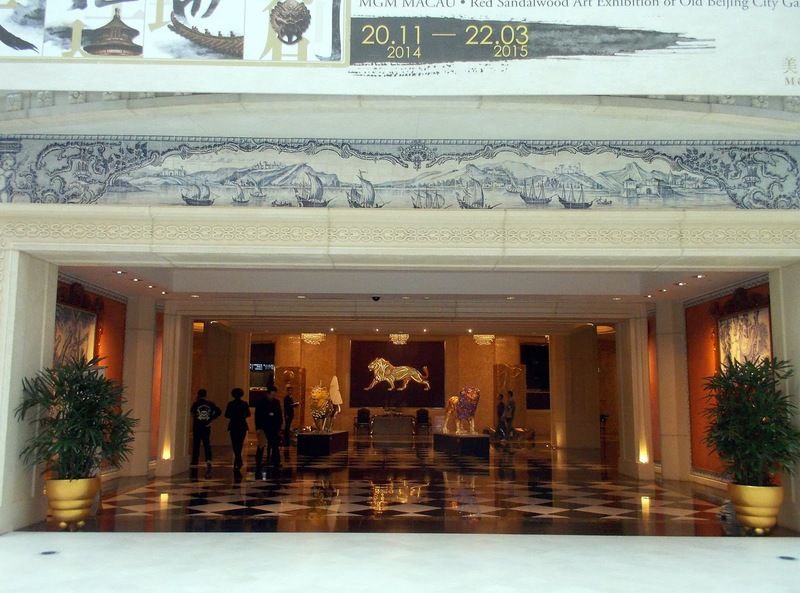 Lion is the MGM icon so you can see lion statues everywhere and even the club is named Golden Lion Club. Lion sculpture again. This one is very delicately rooted to the base. View from the highest floor the staircase could go. Indoor alfresco dining. So chio! 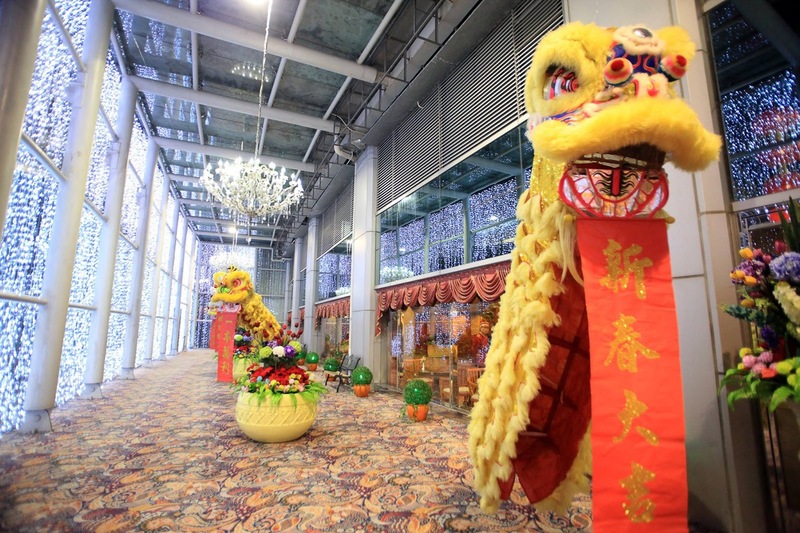 Outside of MGM is a giant golden ram which symbolizes the year of ram/goat/sheep for our lunar new year. I told you hotels in Macau vigorously competing on who has the best deco. 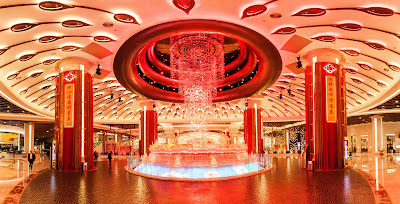 Anthony Melchiorri should come to Macau and be mind blown. Btw I love his Hotel Impossible show. 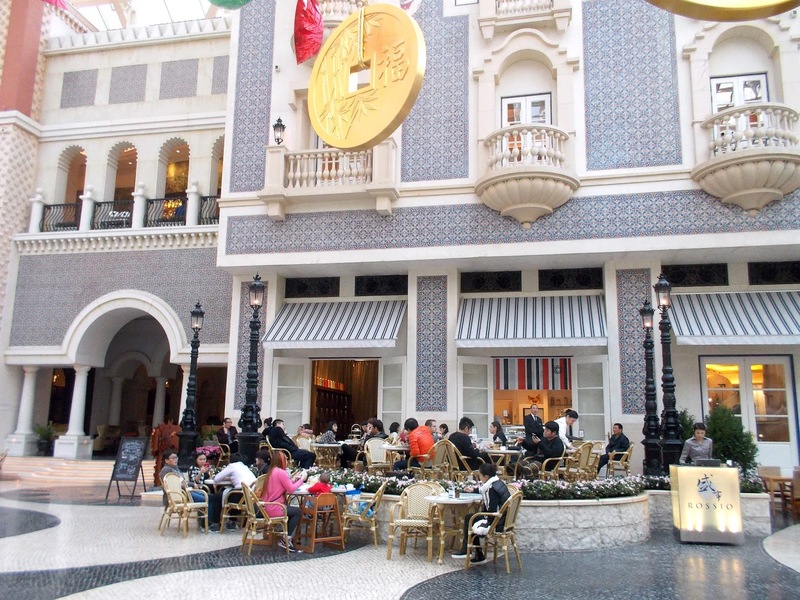 Another grand looking hotel covered in gold exactly opposite MGM is L'Arc Macau. At around 4:50pm we hopped into our next hotel for a brief visit. 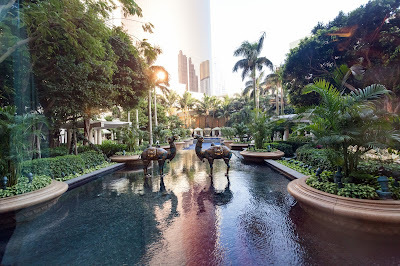 Wynn Macau is athe only resort in the world with 7 Forbes 5 star awards. This place is famous among tourists for it's Dragon of Fortune show. It is divided into two towers; Wynn tower and Encore tower. So this explains why we had to cross a gigantic maze of casinos and almost got lost while searching for the golden dragon coz we went in through the Encore Tower. The show is located at Wynn Tower. Wynn Macau was open to public on 6 September 2006. 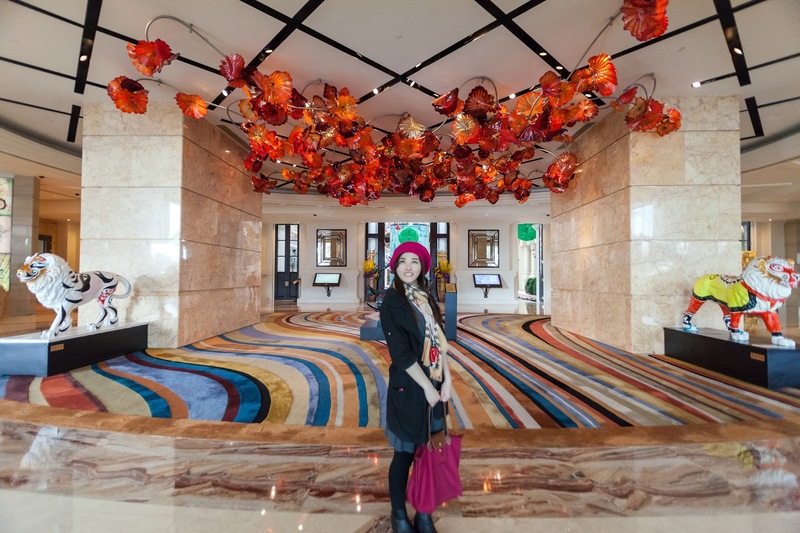 The new Encore tower that has jellyfish behind reception just opened in 2010. 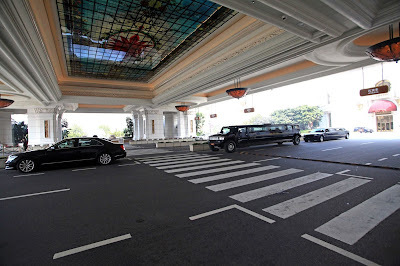 There is also an empty site of 51-acre in Cotai Strip waiting for another upcoming project from Wynn. Chairman and CEO Steve Wynn is known for amassing a large collection of fine art and often placing the pieces in his various casinos and hotels. 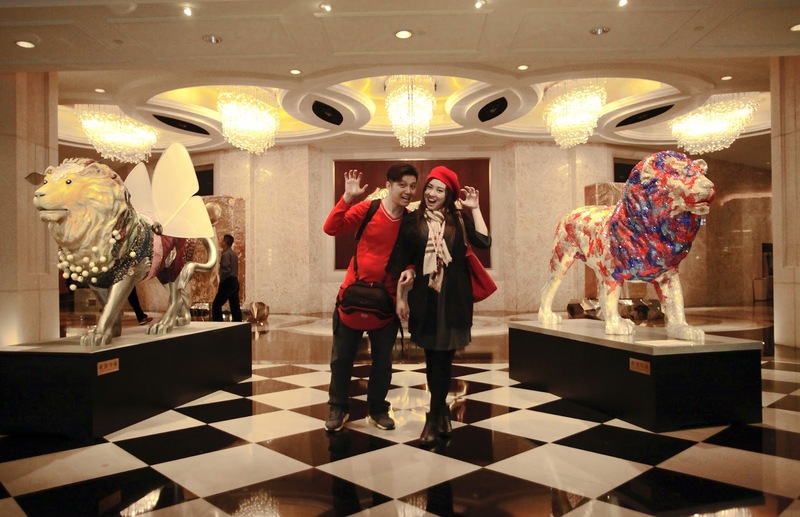 You can find vast collection of art within this hotel. At the beginning of the day we saw a pair of camels on the advert board in the airport. Now we have found them! After like what seemed endless of casinos, we finally reached this dome area. Performance times: Tree of Prosperity and Dragon of Fortune starts 10:30am till midnight daily alternates at 30 minute interval. After like 15 minute of waiting we finally heard music and a sign of movement. The ceiling started to open up. It's amazing how they design the opening. Patterns in the LED screen danced for about 1 minute. 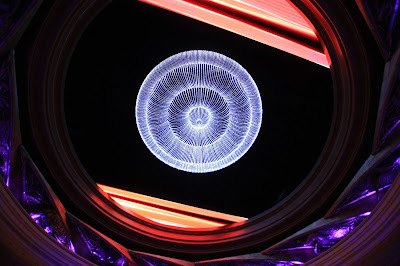 Then a circular blue jellyfish look alike chandelier descended as the screen opened. Instead of a golden dragon, a golden tree ascended from the bottom. Yeah we were too late coz when we drift through the casinos and stopped by for free drinks (yeah most casinos serve free food and drinks for players) the dragon show has already begun and we just saw the tip of the dragon when we exited the casino. Wynn Macau Entertainment: Tree of Prosperity, Dragon of Fortune, Moon jellyfish aquarium, Performance lake. Hubby wanted to see the dancing fountains on the lake after dinner but I urgently needed to get back to hotel coz my feet hurt badly and my contact lens started to irritate my eyes till red. It was such a waste tho. Original audio has been replaced due to copyright. Drag to 0:57 for the opening. What a gorgeous sunset reflecting on the Wynn tower. 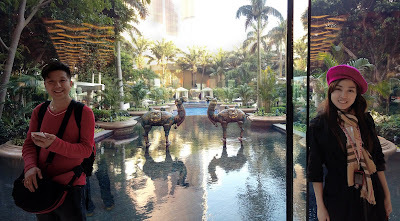 We left Wynn at 5:45pm after wasting time in the casino and contemplating on waiting for the dragon show. This is the original Hotel Lisboa. Another property by Stanley Ho, this 3-storey complex was built in late 1960s and officially opened in 1970. 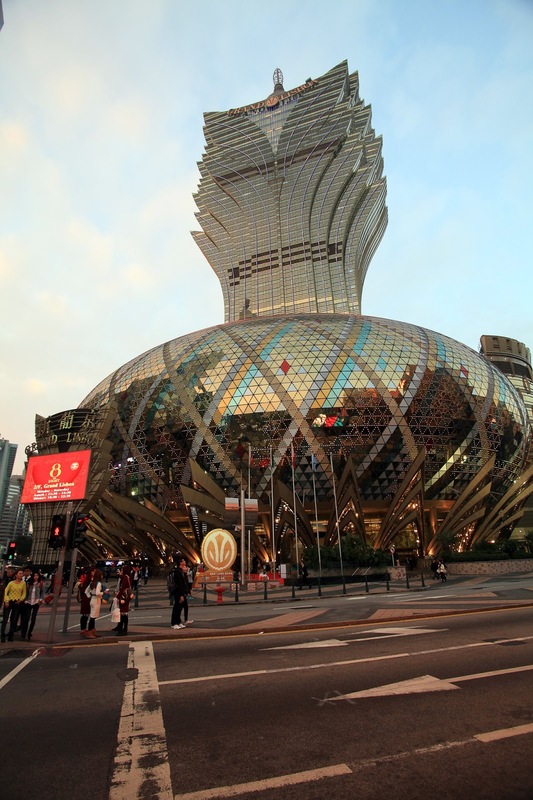 It used to have a 3 star Michelin restaurant, Robuchon á Galera but was moved to the top of Grand Lisboa and renamed to Robuchon au Dôme. Currently Tim's Kitchen is a 1 star Michelin restaurant. Can you taste the bling life? Never forget a jumping pose whenever I'm at a landmark. Let's walk into the Grand Lisboa before hunting for dinner. 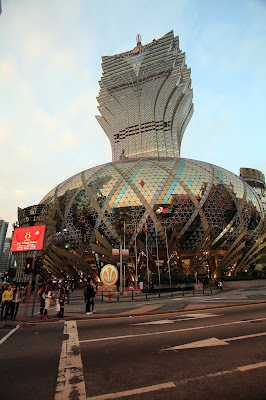 Grand Lisboa stands at 261 meters with 47 floors. Officially opened on December 2008. Adore the crystals hanging from the ceiling. It's magnificent. We just briefly visit the lobby. Not much to see here unlike other hotels we went in today. 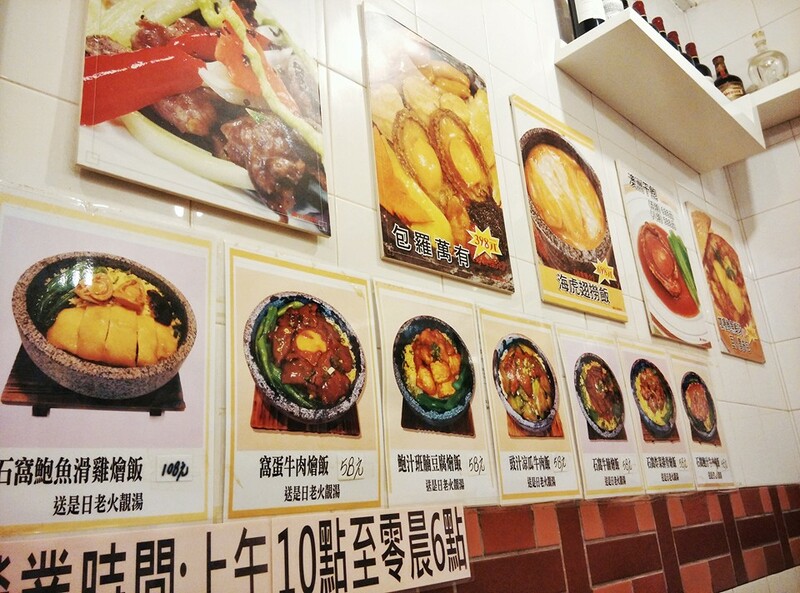 Around 6:30pm we randomly walked into a typical Chinese food outlet that serves abalone and other exotic delicacies. The photo above was taken after our dinner that's why it's dark. 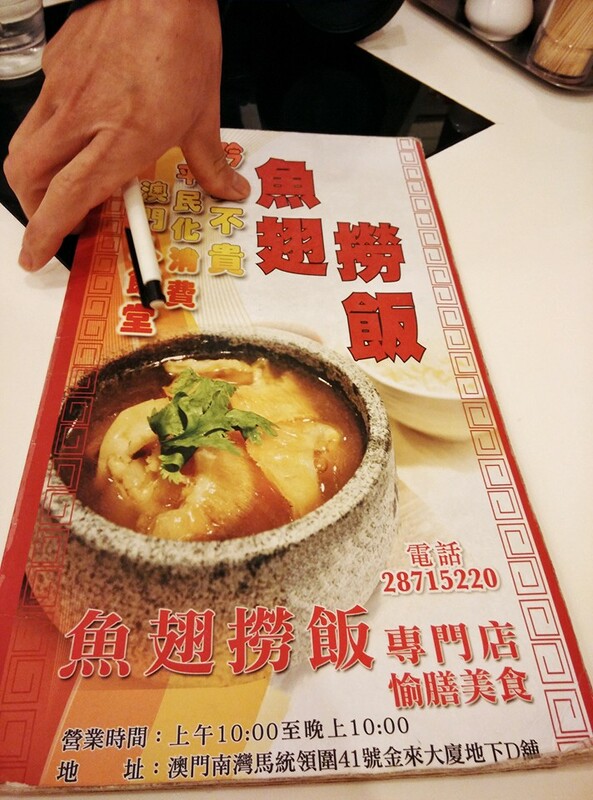 Snap a pic of the menu before the waiter took it away. I ordered pork dish second from the left that has "58" written on while hubby ordered the double abalone and chicken dish on the most left with "108" written. Total damage was RM73.04 for our first dinner. Yummy! So satisfying. We were prepared to spend a lot on food coz Macau is not only a food haven but also known to be expensive. Final night scene captured before we walked to the bus station (Praca Ferreira) opposite the road. It was almost 9pm when we ride MT1 towards Praceta 24 and get off at the airport. After 20 minutes, we arrived at the airport. Our hotel looks awesome at night. Love the fairy lights. 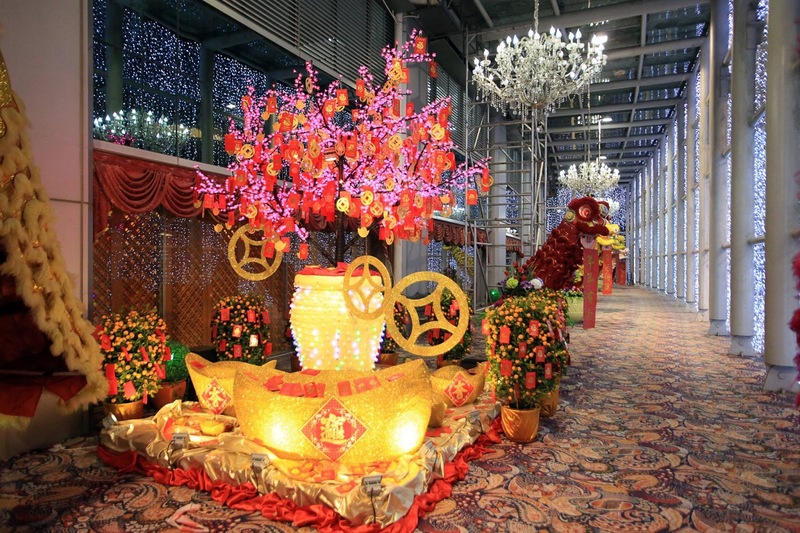 Chinese New Year deco donned the entrance. We were so tired and feet ache. 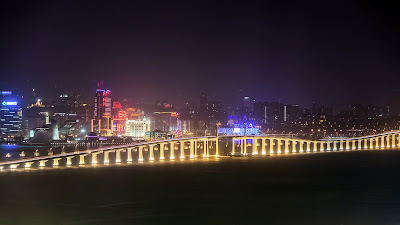 Gorgeous night view of the bridge and peninsula from our window. 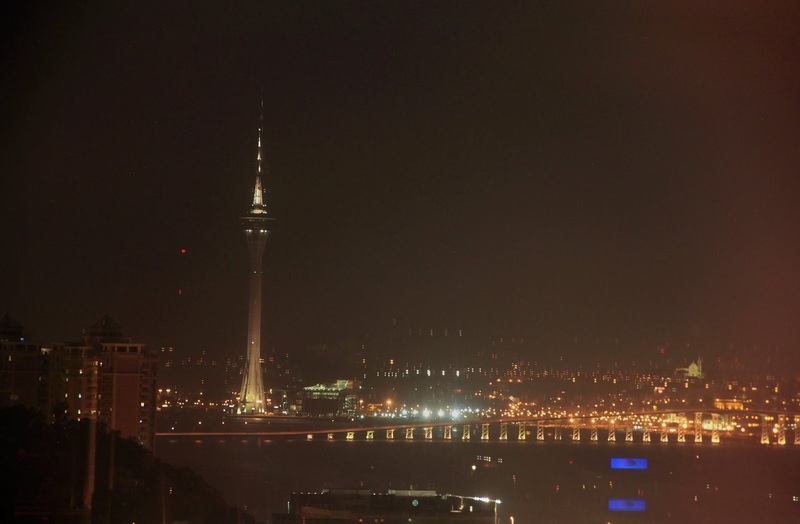 Zoomed in to Macau Tower. 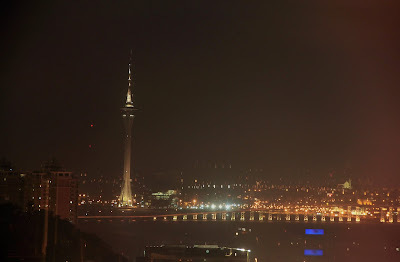 We will be having buffet dinner at Macau Tower 360° Café tomorrow. I didn't know we could see Venetian from our window. Obviously hubby took these shots. Goodnight and see you tomorrow as we visit the famous Ruins of St. Paul, Senado Square and many other heritage sites. If you are lazy to read my blog, you can watch this video that summarizes the trip. Did you went to Senoda Square and HRC?